Whenever I describe Axe Cop, I inevitably bring up the story of Flute Cop . . . how he was "Flute Cop" for just three panels before becoming Dinosaur Soldier, due to exposure to dinosaur blood. This sudden change may be odd in traditional storytelling, but in the sort of world that both Axe Cop and Munchkin inhabit, it makes perfect sense. In Munchkin Axe Cop, Dinosaur is a level 3 Power. It's one of the more useful powers in the set, and since you only need to be third level to pick it up, you'll have plenty of time to take advantage of the Big item bonus. Just remember it when you're picking treasure! 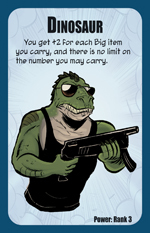 Dinosaur, along with the other 167 cards of Munchkin Axe Cop, will be available this fall in game stores everywhere.